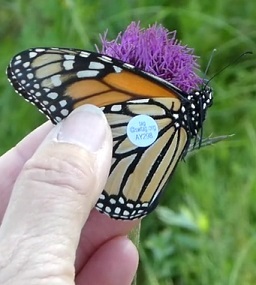 Over 600 volunteers have tagged monarchs throughout the southwest. Lee MacDonald and his mother, Victoria, joined us on a tagging trip at Canelo, Arizona. 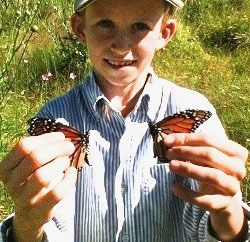 In this photo, Lee proudly shows the two monarchs to be tagged that he captured with his bare hands! DATA! DATA! DATA! We appreciate your time and effort catching and tagging monarchs. Make it count by submitting your data. You can get the electronic data submission forms and printable forms you can use in the field here. Step 1: Catching Monarchs With a Net It’s exciting to tag a monarch for the first time. When you see one, think for a moment of the best way to catch it. Chasing a butterfly with a net and swinging wildly at it usually doesn’t work! Instead, move slowly (moving fast can scare it away). Monarchs can’t see backwards, so sneak up behind it. Try to put your net underneath the butterfly. In a fast sweeping movement, move your net upward to catch the butterfly, then quickly flip your net over so that the opening is now facing down. If you have flipped quickly enough, the net will fold over, trapping the butterfly in the end of the net. Catching Monarchs without a Net In the cool early morning, monarchs are slower. They can be found feeding hungrily on flowers. Slowly walk up behind the monarch. Steadily reach out and grab all four wings gently in your fingers. Monarchs have tiny claws on their feet that allow them to grip tightly and cling to the flower. 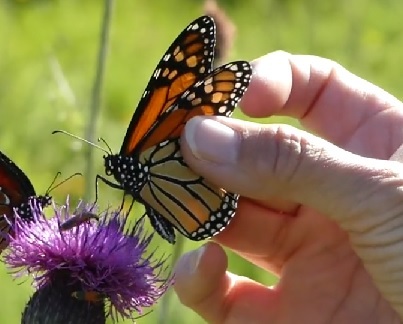 Once you are holding the butterfly securely, gently pull it off the flower. You are now ready to tag. Here is a short video to see how it’s done. Step 2: Handling Monarchs in a Net Place the opening of the net flat on the ground and slide your hand under the hoop and into the net. Gently trap the butterfly in the net so that its wings are folded (as opposed to open). Grasp the leading edge of the folded front wings between the thumb and forefinger and carefully remove the butterfly from the net. Remember, the butterfly’s wings are covered with powdery scales. If too many are rubbed off, it could affect its ability to fly. Step 3: Tagging Monarchs As you hold the butterfly, have a partner record the requested information on the SWMS field datasheet. Click here to learn what data you need to record. Next, have your partner remove a tag from the tag sheet and carefully apply it to the discal cell on the hindwing of the butterfly. Press the tag and wing gently between your thumb and finger. Your body heat will enable the adhesive to go through the scales onto the wing. Here is another short video to see how it’s done. Be sure to record the tag number on the data sheet! After you double check that you have recorded all the necessary information and you are comfortable that the tag is secure, you are ready release the monarch. It may fly off immediately or rest for a few moments before continuing on its way. Step 4: Finding Monarchs! If you have a school or home garden, look for broad, flat flower heads. These provide stable landing pads for butterflies. Sunflowers, tithonia, milkweeds, thistles, lantana, mints and verbena are usually popular with butterflies. They also love rabbitbrush and desert broom during the migration. Monarchs are opportunists, so be sure to check all flowering plants. The best time of day to find monarch butterflies is in the morning and the late afternoon on sunny days. Monarchs are sun-powered and favor temperatures above 55 degrees. Calm or light winds are best.